It came down to four very experienced riders with nothing much to choose between them. Ultimately, two championships were decided in the final sprint with Jamie Henderson finally claiming the title that had eluded him for a while now. The Tom Anderson Memorial Road Race is always one of the most keenly awaited, and hotly contested, races of the season, as it also comprises the Scottish National Veterans Road Race Championships. Hosted by Falkirk BC on the testing Cowie circuit, it covers seven laps of a course that includes long exposed straights, undulating and curving backroads and a short steep climb into Cowie, often the powder-keg point for a breakaway. First time around and the bunch was pretty much complete as everyone took stock of the course, the conditions…and each other. Riders from Leslie Bike Shop/Bikers Boutique were looking particularly keen with defending champion Andy Bruce leading them through and past, but still able to give his customary wave. Later on the same lap it was his teammate Franco Porco stretching his legs at the front as the race came along the wind-assisted section after leaving Cowie and making the left hand turn back towards the east. They were all together apart from Sandy Wallace (Fife Century RC) as he chased a little way behind. Not bad as he was giving away quite a few years to some of the younger guys. Second time through and a group was trying to clip away on the climb. There were more than a few dangerous riders in this group and it was quickly brought back but in classic style Kenny Riddle (Moray Firth CC) made the counter attack and we had a race on our hands. He was quickly joined by Jason Roberts (Pro Vision Scotland) and, alert to the danger posed by these very experienced riders, Andy Bruce and Jamie Henderson (Spokes RT) surged across the gap…and the dye was cast for the rest of the race. Each time around the lead group of four were further ahead, aided in part by teammates back in the bunch. Not exactly riding interference, the Leslie Bikeshop guys and Greig Brown from Pro Vision weren’t pushing on and nobody else appeared willing to take up the reins and organise a concerted chase. As the wind whistled through the power lines overhead, eerie but strangely musical, it was becoming obvious that the winner would come from this quartet…but which one? Getting ready for our last pass on the circuit before relocating to the finish line on the run back towards Stenhousemuir, we had the first major upset…and it wasn’t the sudden downpour. Looking through the trees we saw the leading riders come into view…but they were one short, and it was the Pro Vision rider who was missing. Jason Roberts had punctured and although the Service vehicle was on him and had the wheel changed in a time that would have made the Mercedes F1 team envious, he was left chasing 30 seconds down. He had the bit between his teeth and, while his former companions weren’t putting the hammer down, they couldn’t afford to soft pedal. Chasing for almost a lap at full gas he made the join as they hit the climb for the last time. He later told us that he knew he could never outsprint the others and his plan had been to attack on this last ascent. With his legs blown from the chase this could no longer happen and when the riders approached the finish he had to accept a grandstand view of the final dash for the line. They were all experienced guys and it was Kenny Riddle who took it up, leading out for the line. Putting all his past track experience to good use Jamie Henderson came off his wheel and moved across the road as he put in a massive effort. Also coming off Riddle’s wheel, Andy Bruce made his dash but Henderson had them all beaten and had his arms in the air, teeth gritted in satisfaction at taking this title which he’s been after for a while now. Andy Bruce edged Kenny Riddle for second, and silver, but the Moray Firth rider had 3rd overall and the V50 Championship win, with Roberts finishing in fourth to take bronze in the V40s. 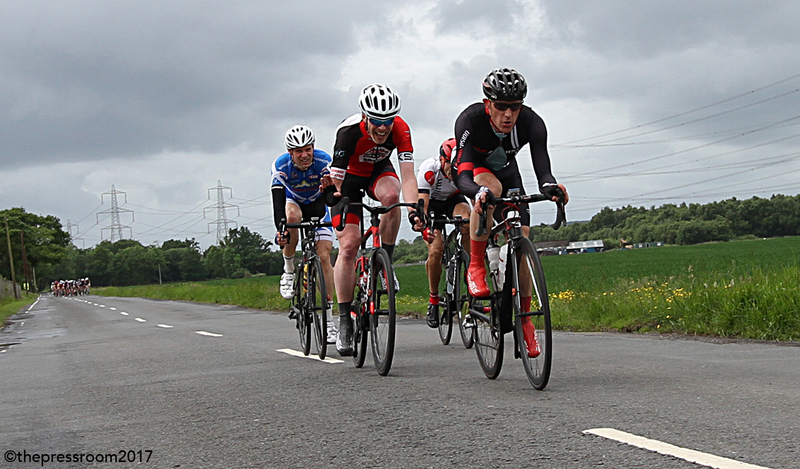 And then it was the turn of the bunch with Dominic Hines (Veloclub Edinburgh) easily besting the opposition. Everyone else came across the line behind the VC Edinburgh rider with little to choose between many of them. Back to the rugby club HQ at Grangemouth for tea and cakes and the prize-giving. Announcing the V50 results it became apparent that there were some issues with the timing chip system and a long wait ensued while the comms and the race officials conferred. The Press Room photographer produced the photographs of the finish and the V50 riders were satisfied that David Blockley (RT23) had secured the bronze with Dominic Hines in silver and Kenny Riddle in Gold. Sandy Wallace picked up the V60 prize. All in all, another successful running of the Tom Anderson Memorial and the new finish line location produced a different kind of sprint from previous years, Jamie Henderson running out a worthy and well-deserved winner.